Running is a great way to stay in shape. Not only that, but running often gives people that much needed “me time.” Unfortunately, those with flat feet tend to have more issues than normal. If you have flat feet, there’s nothing to be ashamed of. The condition is fairly common. There are a number of things that can lead to flat feet. Mainly, genetics plays a huge role. Those with flat feet have to work around their condition. Chances are, you’re familiar with the pain that comes from running regularly. However, with proper care and footwear, you can avoid the pain while improving your performance. When you are looking for a pair of running shoes, you should consider getting a pair that helps with over-pronation. They are just as fashionable as other shoes, but help those with flat feet prevent over-pronating and improve stability. 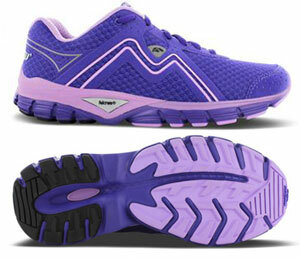 Typically, these shoes are marked as stability and motion control running shoes. While different brands have varying degrees of correction, these shoes typically include a firm insole. Essentially, these shoes create an arch, preventing flat feet from rolling too much inwards. Stability running shoes are best for mild over-pronated feet while motion control shoes are suited for those with severe over-pronation and flat feet. Most likely, you’ll have to get additional insoles to customize the shoe for your feet. Insoles will help to bridge the gap and give you full control and correction. 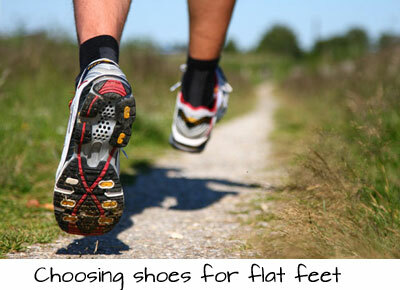 With the right shoes and insoles, you will reduce the chances of pain and injury tremendously. 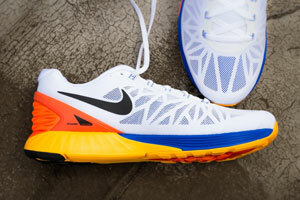 From the iconic Nike brand, the LunarGlide 6 is a great option for those with flat feet. It is designed to maximize support and reduce over-pronation. There’s a dual-density foam that angles inward. This improves stability while slowing down that split-second pronation that occurs. 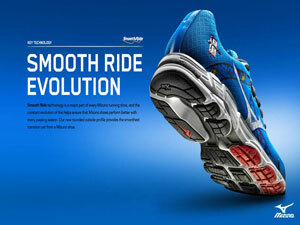 The soles of the shoes are even designed to improve performance and add stability. They are pressure mapped, providing even support throughout the foot. Not only is this shoe great for flat feet runners, but it looks awesome too. You can even customize the shoe to your liking, allowing you to put some style in your morning run. This shoe has a lot of features to help enhance a run. They work to improve stability and make running comfortable for those with flat feet. It has an Impact Guiding System, which is a flexibly component that runs through the shoe and improves gait. It guides the foot with every step, ensuring that its movement is correct. It also has superb insoles. For the middle of the foot, FluidRide technology provides cushion to reduce impact. 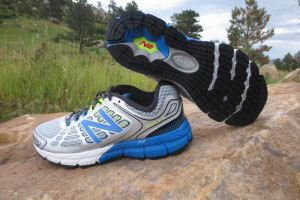 Towards the front and rear of the foot, the shoe incorporates gel cushioning. This reduces impact as the foot moves with every step. It’ll reduce the pressure in the knees as well. This New Balance shoe is specifically made for over-pronators. It has gone through many variations, but the newest v4 shoe has a lot of great features to improve stability and reduce pain. It has a medial post to help with over-pronation by reducing the speed in which it occurs. Furthermore, the shoe has impeccable cushioning. The cushions are different on each zone of the foot. This ensures that the foot gets the best possible support as it goes through a stride.The ABZORB Crash Pad cushion in particular provides motion control and stability. Coming in a slew of bright and fun colors, this shoe will surely make any workout better. This is a high quality shoe that is made for everyday running. It provides lightweight support while still remaining comfortable. For runners who over-pronate, the shoe contains a firm, injection molded midsole. It is attached to an asymmetrical fulcrum. Not only does it look cool, but these components help to reduce over-pronation. The extra support guides the foot in the right direction and prevents injury. The shoe is also very breathable, adding to its comfort. The Mizuno Wave Inspire 10 is suited for those with moderate over-pronation. It has U4ic midsole cushioning that provides stability and support. While effective for moderate over-pronation, those with severely flat feet will need extra support on top of the midsole. The front of the shoe is carefully sculpted to provide cushion. The extra flexible cushioning on this portion of the foot makes transitioning to the next step much easier. If you have flat feet, you may have had others comment on the “weird” way you run. Those people aren’t just being jerks, but actually making a valid observation. While you may not realize it, the feet actually roll inwards with each step. This process is called pronation. It helps to absorb the impact on the feet and prevent injury. It also adds stability and prepares the foot for the next push off. Unfortunately, those with flat feet tend to over-pronate. While it’s not noticeable by runners themselves, others can see it by just watching their feet. This over-pronation is what causes pain and injury. The impact of the foot isn’t spread evenly throughout, putting stress on the ankle. Typically, those with flat feet experience injuries much easier than those with arched feet. The heels and bunions are often the first to be affected. Runners with flat feet tend to push off with their first two toes and bunions exclusively. 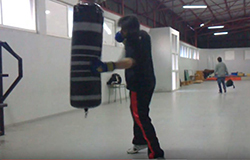 You’ll feel the effects of this action much sooner, making running a bit more arduous. Furthermore, runners can experience issues with their ankles and knees. This is from increased rotation in the lower leg. In fact, this increased rotation may cause your feet to face outward permanently. While it may make you want to not run at all, preventing these issues is just a matter of making a few changes. You can easily prevent pain and enjoy your run. There are a number of different insoles on the market today. You can even choose to get custom insoles to provide personalized comfort to your feet. They are inserted into the shoe and work with the outside of the shoe to provide support. These soft inserts help to provide firm support to the heel and arch. Ultimately, choosing the right insoles will help to prevent over-pronation and actually improve your movement of your limbs and joints. They may seem rather awkward at first, but they’ll improve your performance in the long run. To find the right pair of insoles, you must first determine how flat your feet are and where the pressure lies. From there, you can figure out where you need the most support. How Flat Are Your Feet? Typically, you can tell if your feet are flat. 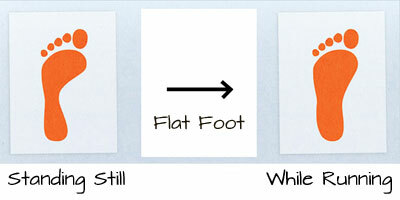 However, there are a couple of different types of flat feet. Flexible flat feet appear to have an arch when no pressure is applied. The flatness is only evident when you put your weight on it. A rigid flat foot is evident regardless of if there’s weight on it. These are usually due to the bone structure of your foot rather than the arch tendons. You can easily determine how flat your feet are by doing a few tests. One way to check is by dipping your foot into water and making a footprint on a blank piece of heavy paper. Doing so will allow you to observe the footprint. If you can see your entire footprint, you have flat feet. Alternatively, you can observe your current running shoes. Those with flat feet will notice that the middle portion of the sole, in the heel area, is worn out more than any other areas. The shoe will also rock back and forth due to the wear. Those with arched feet will have even wear throughout. Most often, flat feet are something you just have to deal with. Eventually, you’ll start to realize what works and what doesn’t. It’ll become second nature. However, there are instances in which flat feet indicate something worse. In some cases, it is recommended that people with flat feet visit an orthopedic surgeon. Usually, this is recommended when flat feet cause immense pain or if one foot is flatter than the other. These severe cases are often signs of issues within the tibial tendon, which supports the arch. These issues aren’t caused by genetics, but rather conditions like diabetes and high blood pressure. An orthopedic surgeon will be able to help alleviate the issue by performing surgery on the tendon. This will often restore the arch and remove any signs of pain that come with flat feet. However, it should be noted that this surgery is only recommended to those that have issues with the tendon. For the rest of us, flat feet are just something we have to learn to live with and manage. Thankfully, we have things like special shoes and insoles to make our runs and daily exercises much more comfortable.